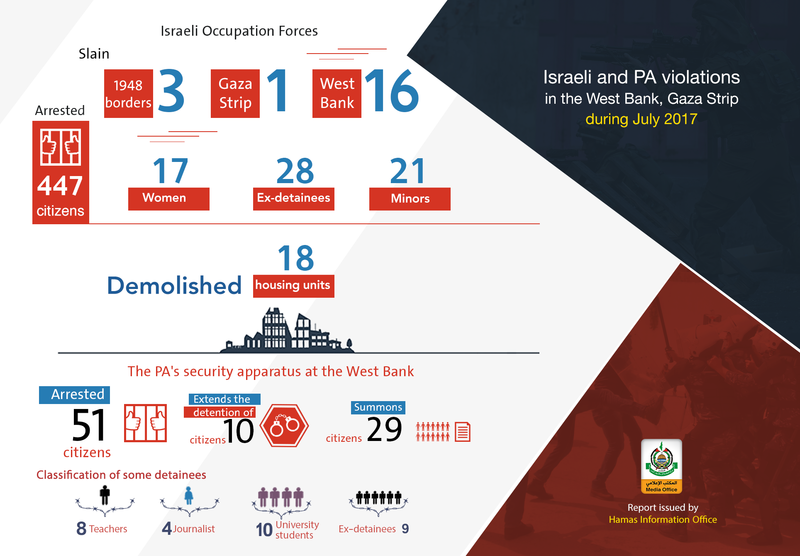 The media office of Hamas issued its monthly report that documents the violations perpetrated by the Israeli Occupation and the Palestinian Authority (PA) across the West Bank and the Gaza Strip over July. The report mentioned that the Israeli Occupation killed 20 Palestinians: 16 from the West Bank, 3 from the 1948 occupied territories, and one from the Gaza Strip. The Israeli Occupation arrested about 446 Palestinians including two MPs, 21 minors, 28 ex-prisoners, and 17 women. Also, the IOF arrested two Palestinians who were previously held in the PA's custody. The IOF as well demolished 18 Palestinian homes and at the same time issued the permits for constructing 9960 Israeli housing units in occupied Jerusalem. The report documented the arrest of 51 of the Palestinian resistance operatives: 50 from Hamas and one from Fatah Al intifada. The PA's security apparatus summoned 29 citizens, and it extended the detention of 10, while turning 5 Israelis back, who allegedly lost their way inside Palestinian cities,to the Israeli side.